Peptide CEWRQGDGKGITR, corresponding to amino acid residues 541-553 of human Ret (Accession P07949). Extracellular, N-terminus. Homology Mouse - identical; rat - 12/13 amino acid residues identical. Specificity This antibody will recognize the intact Ret receptor and the cleaved Ret extracellular cell-membrane anchored fragment. It won't recognize the cleaved Ret kinase fragment. 1,2. Anti-Ret (extracellular) Antibody (#ANT-025), (1:200). 3,4. Anti-Ret (extracellular) Antibody, preincubated with the control peptide antigen. Immunohistochemical staining of rat dorsal root ganglia (DRG) frozen sections using Anti-Ret (extracellular) Antibody (#ANT-025), (1:50). Ret staining (red) is detected in DRG neurons. Hoechst 33342 (blue) is used to stain cell nuclei. ___ Unstained cells + goat-anti-rabbit-AlexaFluor-647 secondary antibody. ___ Cells + Anti-Ret (extracellular) Antibody (#ANT-025), (1:20) + goat-anti-rabbit-AlexaFluor-647 secondary antibody. Cell surface detection of Ret in live intact human MCF-7 breast adenocarcinoma cells. 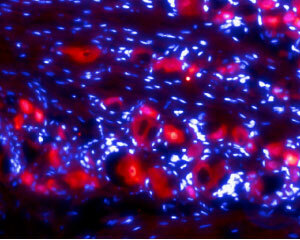 A. Extracellular staining of cells with Anti-Ret (extracellular) Antibody (#ANT-025), (1:25), followed by goat anti-rabbit-AlexaFluor-594 secondary antibody (red). B. Live image of the cells. C. Merge of the two images. Durbec, P. et al. (1996) Nature 381, 789. Cabrera J.R. et al. (2011) J. Biol. Chem. 286, 14628. Anders, J. et al. (2001) J. Biol. Chem. 276, 35808. Runeberg-Roos, P. and Saarma, M. (2007) Ann. Med. 39, 572. Knowles, P.P. et al. (2006) J. Biol. Chem. 281, 33577. The RET proto-oncogene on human chromosome 10q11.2, encodes a receptor tyrosine kinase (RTK) activated by members of the glial cell line-derived neurotrophic factor (GDNF) ligand family (GDNF, neurturin, artemin, and persephin) in conjunction with a ligand-specific coreceptor (GFRα1-4)1. RET belongs to the cadherin superfamily, and it has been suggested that the ret gene is the result of a recombination between a gene encoding a tyrosine kinase receptor and a gene encoding an ancestral cadherin at an early stage of evolution2. The extracellular domain of RET comprises, as observed for other tyrosine kinase receptors, a cysteine-rich domain, but also four cadherin-like domains3. RET signaling is crucial for the development of the enteric nervous system. RET also regulates the development of sympathetic, parasympathetic, motor, and sensory neurons, and is necessary for the postnatal maintenance of dopaminergic neurons. Outside the nervous system, RET is crucial for development of the kidney and plays a key role in spermatogenesis3. RET has attracted considerable clinical interest because of the range of mutations found in diverse conditions that include Hirschsprung disease and a variety of cancers involving the thyroid gland. RET-related cancers with thyroid involvement include sporadic and familial medullary thyroid carcinoma (MTC), multiple endocrine neoplasia 2 (MEN2) syndromes MEN2A and MEN2B, and papillary thyroid carcinoma (PTC)4. Alomone Labs is pleased to offer a highly specific antibody directed against an extracellular epitope of human Ret. Anti-Ret (extracellular) Antibody (# ANT-025) can be used in western blot, indirect flow cytometry, immunohistochemistry and immunocytochemistry applications and has been designed to recognize Ret from rat, mouse and human samples.